It's known as some of the saddest ground in America, a 14-acre plot of Arlington National Cemetery called Section 60 where many U.S. personnel killed in Iraq and Afghanistan are interred. 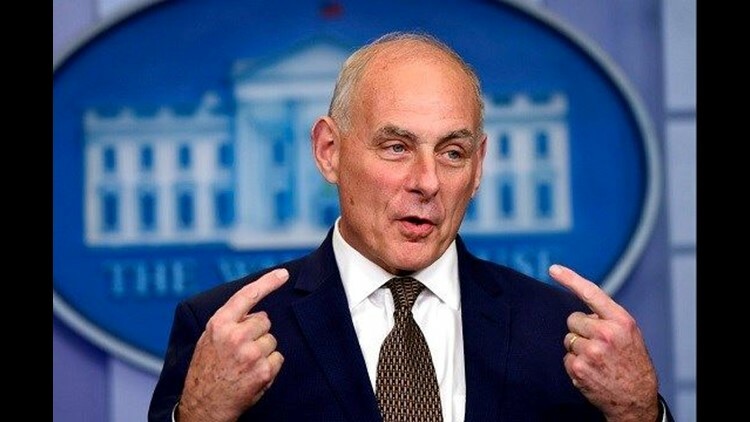 WASHINGTON (AP) — White House chief of staff John Kelly delivered an extraordinary denunciation of a Democratic congresswoman Thursday, accusing her of politicizing what he called a "sacred" presidential effort to console the grieving loved ones of a slain soldier. Kelly, in an unexpected and emotional appearance in the White House briefing room, invoked the death of his own son, killed in Afghanistan in 2010, as he lashed out at Rep. Frederica Wilson of Florida, who earlier this week said that President Donald Trump had been disrespectful in his condolence call to the family of a soldier killed during an ambush in Niger. Kelly, speaking slowly and forcefully, said he was "heartbroken" that Wilson overheard the conversation and used it to attack the president. "It stuns me that a member of Congress listened into that conversation," said Kelly. "It stuns me. And I thought at least that was sacred." Trump has emphatically rejected claims that he was disrespectful. But he ignited a storm of his own this week when he boasted about his commitment to calling service members' next of kin and brought Kelly into the controversy by wondering aloud if President Barack Obama had called the former Marine general after the death of Kelly's son. Kelly confirmed Thursday that Obama had not called, but he made clear "that's not a criticism." "That's not a negative thing," he said. "I don't believe all presidents call. I believe they all write." He revealed that when Trump took office, he urged the president not to make those calls, saying "I said to him, 'Sir there's nothing you can do to lighten the burden on these families.'" But when Trump indicated he wanted to do so, Kelly revealed to him what General Joseph Dunford, now chairman of the Joint Chiefs of Staff, told him when Robert Kelly was killed. Kelly recalled that Dunford said his son "was doing exactly what he wanted to do when he was killed. He knew what he was getting into. He knew what the possibilities were because we're at war." And Kelly added that Dunford told him that "when he died, he was surrounded by the best men on this earth, his friends. That's what the president tried to say to four families the other day." Hs speech was a direct rebuke to Wilson, who was in the car with Sgt. La David Johnson's family in Miami when Trump called Tuesday. She said in an interview that Trump had told the widow that "you know that this could happen when you signed up for it ... but it still hurts." He also referred to Johnson as "your guy," Wilson said, which the congresswoman found insensitive. Robert Kelly, 29, was killed when he stepped on a land mine in Afghanistan's remote Helmand province. His father, aware that the son accompanied almost patrols through mine-filled battlefields, had just days before warned the family of the potential danger, according to a report in The Washington Post. Kelly on Thursday said that his family got calls from Robert's friends in Afghanistan attesting to his character. Those calls, he said as he fought back tears, were the most important. Associated Press writer Laurie Kellman contributed reporting.